This Thanksgiving we have so much to be thankful for here at Crunkleton. Listed below are just a few of the reasons we feel so overwhelmingly blessed this holiday season. This year we were able to add two new team members to our motley crew, Kadie joined us in January and Anusha followed just a few weeks later! We’ve had the privilege to be a part of several exciting new projects that broke ground in 2015, The Avenue, Winchester Commons & Cornerstone Place! We can’t wait to see these projects come alive in 2016! Of course one of our favorite things to do is help bring new businesses to Huntsville. This year we’ve been able to assist in bringing several new retailers to the area such as: Small Cakes, 9Round, The Pants Store, Uncle Maddios & Amazing Lash Studio! The moments we have felt most blessed of all this year have hands down been all the opprotunities we’ve had to give back to our community. Wether it be through helping support non profits like Downtown Huntsville Inc through events like the Pop-Up Parks, or simply donating our time to amazing organizations such as Lincoln Village & Casa Of Madison County. Each of these opportunities has filled us with so much joy and blessed us more than we can express. So thank you Huntsville for blessing us with an amazing 2015, we have so very much to be thankful for this Thanksgiving and we couldn’t have done any of it without you. Happy Thanksgiving from our team to you! 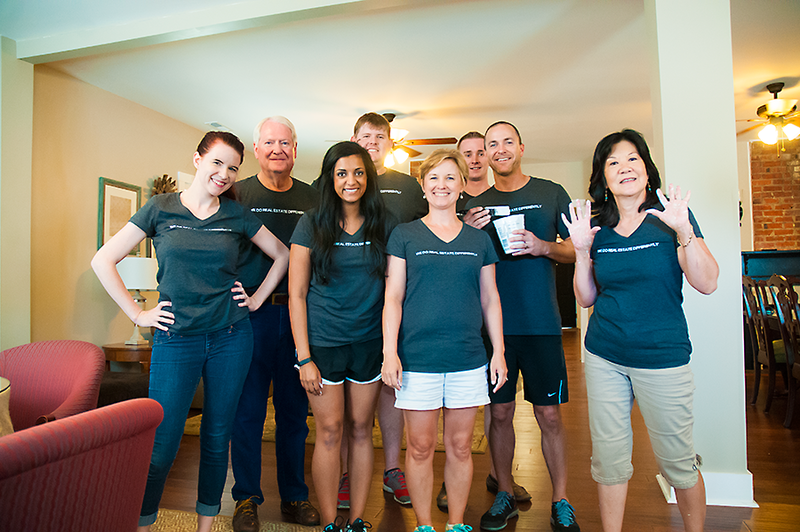 A few weeks ago we left our business suits behind, rolled up our sleeves, donned our best painting attire and headed down to Lincoln Village Ministry to volunteer! While there, we fell in love with the organization and just had to share our experience with you to help spread the word about all the wonderful things they are doing for our Huntsville community and let you know how you too can get involved! Lincoln Village Ministry is a non-profit organization that helps to educate, shelter, comfort and serve the underprivileged Lincoln Village community. Founded in 2002 when Mark Stearns met a little girl sitting outside her dilapidated house in the Lincoln Mills area, he was invited inside to find living conditions suited more to a 3rd world country than something that should exist just a few blocks away from one of the wealthiest neighborhoods in Huntsville. The little girl’s mother had been beaten by her boyfriend so severely that she had suffered mental retardation and was incapable of caring for herself or her daughter. The house itself had no running water, electricity or furniture but the family had continued using the facilities, causing the house to gain an extreme foul order. 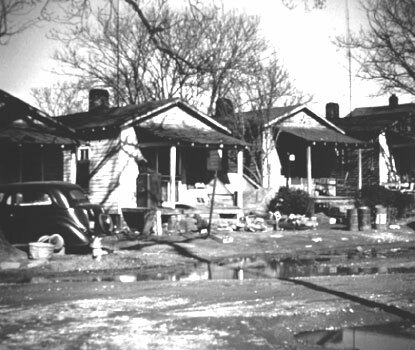 Heartbroken by the surroundings he saw before him, and knowing that this family was just one of many living in similar conditions in the Lincoln Mills area, Stearns felt called to improve the lives of these people and serve them in any way he could. Partnering with a local church, Lincoln Village Ministry was born and it’s workers began a mission to break the cycle of poverty they had witnessed. Word quickly spread and the organization has grown by leaps and bounds. Presently they not only own and operate their own private school where underprivileged children from the Lincoln Mills Community can receive a 100% free education, be partnered with local community mentors, eat three square meals a day and participate in before and after school programs, they also provide programs for the children’s parents as well. 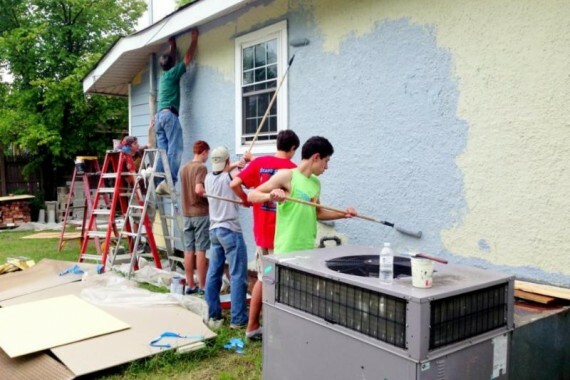 Over the last several years the organization has begun the process of slowly purchasing homes in the area, renovating them and then making them available for rent at prices the families in the neighborhood can afford. In addition to the affordable housing, the organization also helps come along side each family with career counseling, personal financial advice, and even cooking lessons to help give them the tools they need to succeed, and their efforts are changing the face of an entire community. We were so blessed to get involved with this amazing organization and do our best to help out for the day! If you are interested in finding out how you can get involved with either their student mentorship programs, or other volunteer opportunities, CLICK HERE! Or, if you’d like to, sign up to join our volunteer team and be notified the next time we help out in the community by sending us an email at info@crunkletonassociates.com! 2014 has been a big year here at Crunkleton & Associates. Here are just a few of our proudest moments from 2014! In June of 2014, Crunkleton & Associates announced their involvement with “The Avenue,” a five-story, mixed-use development that will feature 21,000 square feet of street-level restaurant and retail space downtown. In addition to the retail center, the project will also host 193 loft-style apartments and a large on-site parking garage. Developer Charlie Sealy stated that he believes the project will be “another game-changer for downtown” and we completely agree! The first phases of the project are scheduled to open in January 2016, and the entire project should be finished by that April. One of our favorite things that we were able to do this year was help facilitate bringing several brand new dining options to Huntsville as part of the Twickenham Square project! This Birmingham-based restaurant specializing in Thai food, sushi, Pan-Asian infused cuisine and American fare announced that it would be joining the tenants at Twickenham Square in August and opened its doors for business on Dec. 5th. Our favorite thing on the menu? The sushi, hands down! From a small roadside stand where he dished up recipes he grew up eating in Louisiana, to his brand new 3,000 square foot restaurant here in Huntsville, owner Jeff Thompson has come a long way with his Birmingham-based eatery. Cajun Steamer, which is scheduled to open in the next month, will feature classic Cajun cuisine such as gumbo, jambalaya, boudin and étouffée, oysters, crawfish and, of course, Po-boys. Oh and did we mention homemade beignets!? We’re just a little excited about the beignets. Taco Mama added its third northern Alabama, and first Huntsville location to Twickenham Square in the fall of 2014, growing from its Mountain Brook and Tuscaloosa locations and the founders couldn’t be more excited. “To now be joining a community like Huntsville, that has boasted so much growth and positivity over the past decade, our team couldn’t ask for anything more,” commented Will Haver, Taco Mama Owner and Founder. We love the laid back atmosphere and fast service that is perfect for a quick work lunch as well as the freshly prepared tacos, burritos, nachos and Mexican fare. Chocolate lovers jumped for joy earlier this fall when we announced the fifth and final restaurant that would be joining the Twickenham Square development: Chocolate Martini Bar. This swanky eatery will be dishing up a wide range of traditional and “liquid desserts” in addition to a full menu of savory items, each with their own unique chocolaty twist. And while we’re excited about all the delicious chocolate fare, (I mean who doesn’t like chocolate?) it’s the free chair massages the restaurant plans to offer every Wednesday night to anyone who stops in that has us really excited for them to open their doors in the spring of this year! Crunkleton & Associates Breaks Ground On Their New Offices! One of the most exciting things for us here at Crunkleton & Associates this year was the ground breaking for our new offices on October 14th of 2014! Over the last several years, we have been growing and expanding our roster of talented individuals in order to continually provide the best possible service to our clients. All that growth has been amazing for our business but tough on our personal space. The new 18,000 square foot office complex we will be joining is part of a unique expansion project for legal firm Maynard Cooper & Gale in Huntsville, AL. The law firm will occupy the entire second floor of the building, and Crunkleton & Associates is excited to be sharing the first floor space with GW Jones Properties. And the best part? Our new building is right across the street from where we are currently located. How’s that for a convenient move? And one more mystery tenant that we will be announcing very soon! 2014 also brought us the opportunity to help facilitate the expansion of the Valley Bend shopping center in Jones Valley with addition of Kirkland’s and by creating a larger retail space for Fleet Feet Sports. Crunkleton & Associates was proud to be a part of two major land deals this year. One for the site of the new Walmart in Hazel Green and the other for the site of the New Veterans Facility. This year Crunkleton & Associates surpassed the one million square foot mark for properties managed with the addition of three new properties! Among out proudest moments in 2014 are the times when we were able to give back to the community by donating to non-profits or sponsoring community events. Here are just a few of the organizations we were proud to support in 2014 and hope you may consider supporting in 2015. Thanks For Helping Make 2014 Amazing! We Can’t Wait To See Where 2015 Takes Us! 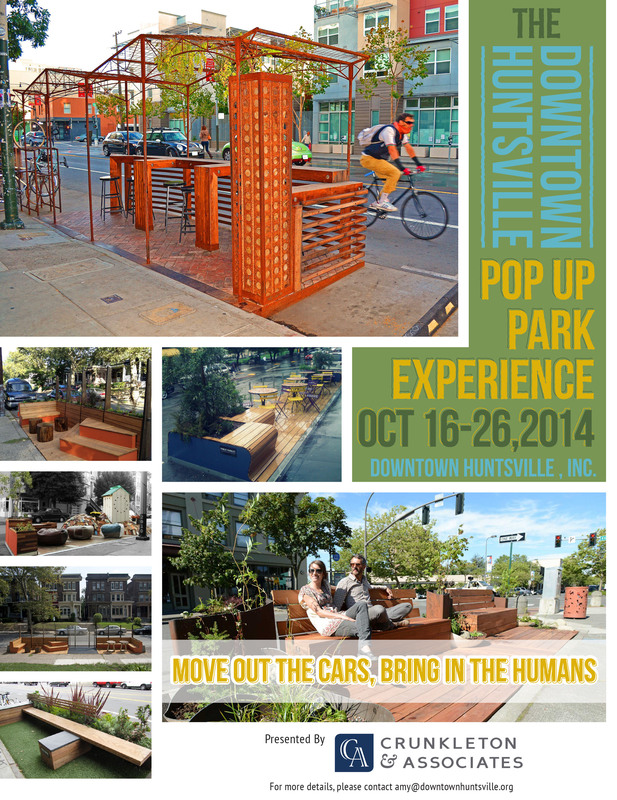 Downtown Huntsville, Inc.’s Pop Up Parks are back! Parking spaces around downtown have been transformed in to music stages, playgrounds, life-sized checker boards, a helicopter cockpit (that makes some very life-like sounds) and human foosball fields. Crunkleton & Associates is proud to be the sponsor for this year’s event. Be sure to stop by and check out the creative designs by area businesses and organizations. The parks will be downtown until October 26th. Here are a few pictures of part of the Crunkleton & Associates team enjoying the beautiful weather and Pop Up Parks.